To live a life free from abuse and harm is a basic human right. We are all responsible for the protection of people at risk from abuse. Vulnerable adults rely on us to take the right steps to help keep them safe. If we don’t, who will? To ignore abuse and neglect is to allow it to continue and that is never acceptable. 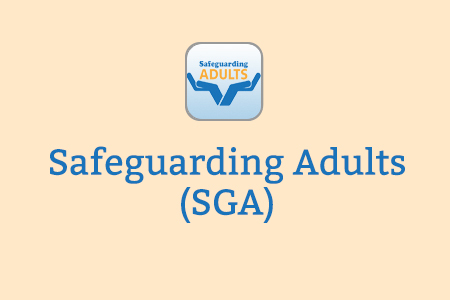 This online learning resource is an introduction to the requirements and responsibilities for Safeguarding Adults. The two modules address the learning outcomes defined in the UK Core Skills Training Framework (version 1.2, September 2014). Level 1 is intended for all staff working within health and care organisations, including paid and voluntary staff. Level 2 is intended for staff with professional and organisational responsibility for safeguarding adults, able to act on concerns and to work within an inter- or multi-agency context. The programme was originally commissioned by NHS South Central, and subsequently updated by Health Education Thames Valley and Health Education Wessex on behalf of Health Education England, with input from adult safeguarding experts working in a range of roles in NHS organisations and local authorities across the south of England and the Midlands. If you already have an account with e-LfH, then you can enrol on to the Safeguarding Adults programme by logging in to the e-LfH Hub, selecting My Account > Enrolment and selecting the programme. You can then access the programme immediately in the My e-Learning section. To register for the Safeguarding Adults programme, select the Register button. Select the option ‘I am a care home or hospice worker’ then enter your care home / hospice name or postcode and select it from the options available in the drop down list. Finally enter your care home / hospice registration code and select ‘Register’. You may need to see your employer to get this code. Access to e-LfH content is available to all social care professionals in England whose employers are registered with the Skills for Care National Minimum Data Set for Social Care (NMDS-SC). Every employer providing NMDS-SC workforce information to Skills for Care has been given a user registration code for their staff. This code enables you to self-register for access to Safeguarding Adults. Please contact your employer for more details about the registration code. For information about registering your organisation with the NMDS-SC your employer should access www.nmds-sc-online.org.uk or contact the Skills for Care Support Service on 0845 8730129. The Safeguarding Adults programme is also available to NHS healthcare staff via the Electronic Staff Record (ESR). Accessing this e-Learning via ESR means that your completions will transfer with you throughout your NHS career.